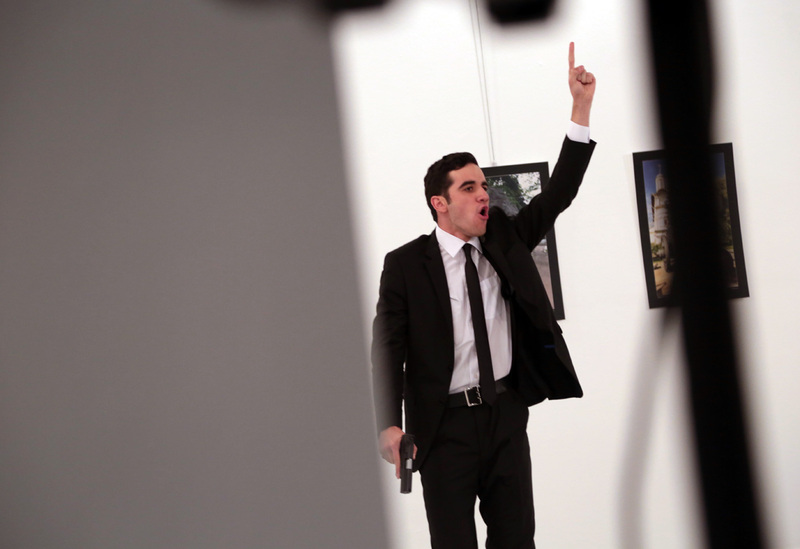 An unnamed gunman gestures after shooting the Russian Ambassador to Turkey, Andrei Karlov, at a photo gallery in Ankara, Dec. 19, 2016. The number of suspects linked to the murder of Russia’s ambassador to Turkey that have been arrested has risen to 13, Turkey’s TV Channel Haber 7 reported on Dec. 21. Six suspects have been arrested in the Aidyn province where the assailant, Mevlut Mert Altyntash, was born. Among those arrested were his father, mother, sister and other relatives. Another six suspects were detained in Izmir. In addition, an attorney who owns an apartment, where the assassin had resided for a short period of time, has also been arrested, the TV channel reported. Some those in custody have been taken to the security department for interrogation. Police will transfer the other suspects to Ankara a bit later. Russia’s envoy to Turkey, Andrey Karlov, was gunned down in Ankara on Dec. 19 as he was opening a photo exhibition entitled "Russia: From Kaliningrad to Kamchatka, through the eyes of a traveler." According to Ankara, Turkish security services liquidated the assassin who turned out to be a policeman. Three people were injured in the shooting, which the Russian Foreign Ministry described as a terror attack. The Russian Investigative Committee, which initiated criminal proceedings, classified Karlov’s murder as an act of international terrorism.